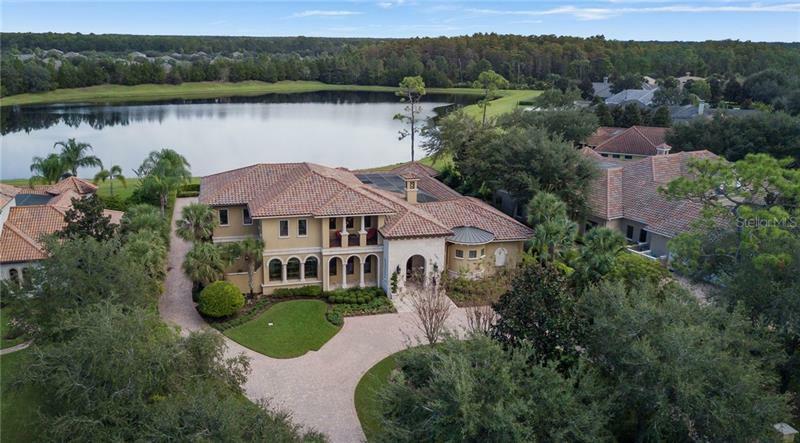 Experience the ultimate in architecture and design in this grand two-story estate overlooking beautiful water and conservation views within the gated community of Lake Nona Golf & Country Club. Enhanced both inside and out by the finest finishes the home encompasses more than 10000 square feet of interior and exterior living space. Enjoy the rich details of this sophisticated residence throughout the interior from French entry doors chiseled-edge travertine and tile to stone column accents and hand-textured wall treatments. The home evokes pure elegance which is perhaps best captured in the dramatic two-story stair hall that joins the formal living and dining rooms to the kitchen and family room. Highlights of these primary living spaces also include a soaring ceiling and fireplace in the formal living room and a well-appointed Butler’s pantry and private courtyard outside the dining room. Indulge in Florida’s year-round temperate climate in the expansive outdoor living area featuring a covered lanai with fireplace and summer kitchen. Surrounded by a lovely colonnade with Gazebo the screened area also offers a custom heated pool and spa are further accented by a fountain and waterfall. Additional features include a master suite with vestibule morning bar walk-in closet Jacuzzi tub and separate walk-in shower a theater with projector screen and full wet bar and a three-car garage.